This picture is from Here Comes the Food. Before we left for Australia, my daughter asked me, "What are you most excited about in going to Australia?" I tried lots of things in Australia (translation: more posts on Australia coming up), but the best food I had by far in Australia was on the recommendation of Trissa from Trissaliscious. I had the pleasure of meeting her and Ellie from Almost Bourdain over some great Japanese food at Masuya Japanese Seafood Restaurant, which I wrote about here. Trissa pointed us in the direction of Palace Chinese for a dim sum lunch, so we went there before we headed for the airport to go back to Melbourne. It was very close to the Westin Sydney where we stayed in City Centre. In addition to being a business center, City Centre a shopping mecca with the most malls I've ever seen in a radius of a few blocks, including the famous Queen Victoria Building, the Strand, David Jones with its to-die-for foodhall, and the Sydney Central Plaza mall, where we ate three times in its food court. City Centre is also only a 20-minute walk to the Sydney Opera House, which was *stunning*. 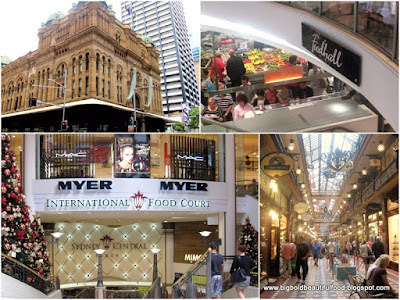 In fact, it seemed like most of the city's attractions were walking distance and that the parts of Sydney that guidebooks focus on is fairly compact. In City Centre is also the Sydney Tower, where we enjoyed city views before we went to dim sum. Palace Chinese is in a mall (yes, another mall), on the second floor off the food court. It was voted the best Yum Cha in Sydney in 2008, and I totally understand why. We went a little before 12 pm, and that was a great idea because by 12:30 pm, the waiting line was quite deep. 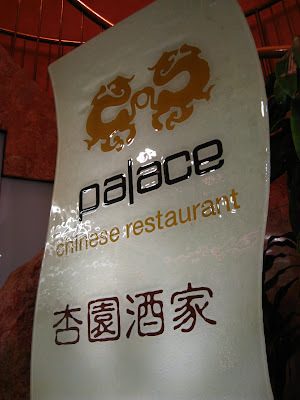 Like many dim sum places, Palace Chinese was a large space, with lots of tables and lots of carts passing by with yummy things to eat. Here's my husband picking our first choices. We chose pork shumai, prawn dumplings, and chive dumplings. Australia is known for the freshness of its seafood for good reason. We live on the coast of the United States and have better access to fresh fish than the U.S.' interior, but we could taste the difference in the quality of the seafood. My daughter Lizzy loves duck, so we couldn't let this go by ... Oh my, this was good, juicy and flavorful. I think the Chinese make the best duck in the world. We also got some beef wrapped in a rice noodle, but that got devoured before I could take a picture. After that, we decided to go for dessert. I'm not sure the name of this, but it was like a cold mango soup with tapioca balls and fresh fruit. If anyone knows what this is, please comment and let me know. So refreshing! And then, we had these luscious, warm mochi balls, filled with black sesame paste and rolled in sesame seeds, nuts, and something else. I dream about these now. If anyone can tell me how to make these, I'd be so appreciative. Click here to see the restaurant's picture gallery of some of their offerings. Go get a napkin before you do, because you'll start drooling! Truly, this is the one place I will regret not having the chance to go again. Looks like you had a great time. I, too, love the food in Australia. Thanks for sharing your experience. YAY! So glad you liked Palace Ninette! I'm there almost every week with my officemates. Many of them are from Hong Kong and they seemed to think it was okay. Glad it passed with you! I too always look forward to trying different foods when traveling. Sounds like you had a blast - the Chinese food looks terrific. What a fantastic trip with your family. So glad you shared some of the treats with all of us! I still dream of a trip to Australia...some day. The soup is called mango pomelo sago. If you Google it, there are tons of recipes; some really simple, others more complex but they all contain the same basic ingredients. Apparently, in addition to the pomelo, you can add any fresh fruit that you like. I haven't made it before, but it looks so refreshing, I'm going to have to give it a try!